Environmental science is the study of organisms as they relate to their environment, and the physical, biological, and chemical processes that impact these relationships. One example of a specific branch of environmental science is the study of pollution, and its relation to renewable energy, conservation, and other solutions to pollution-related problems. Other areas of the field include ecology, wildlife biology, environmental engineering, and natural resource management. Environmental scientists often begin their career by earning an undergraduate degree. All environmental science programs introduce students to the fundamentals of ecology, conservation science, geology, organic chemistry, natural resource management, and other key dimensions in the field. Lab work is typically required and many programs culminate with a capstone research project, which allows students to demonstrate their new skills and knowledge. Internships are often required as well. Today, many students are choosing to earn their bachelor's degree in environmental science online. Distance learners adhere to the same rigorous standards as students in brick-and-mortar programs, and they graduate prepared to pursue a variety of career opportunities. The asynchronous format found in most online programs is also ideal for students with part-time jobs, childcare responsibilities, or other commitments that may interfere with their ability to regularly commute to campus. Read on to learn more about the field, and the kind of career opportunities you can pursue with an online bachelor's degree in environmental science. WILL AN ONLINE ENVIRONMENTAL SCIENCE DEGREE PROGRAM PROVIDE ME WITH THE SKILLS I NEED TO ADVANCE MY CAREER? Online bachelor's in environmental science programs provide distance learners with a comprehensive introduction to the field. Many colleges and universities allow students to follow a concentration study track and earn a specialized degree in fish and wildlife management, sustainability, environmental technology, or other subfields in the discipline. Students who complete an internship will further bolster their career standing through supervised, hands-on training from experienced professionals. WILL AN ONLINE ENVIRONMENTAL SCIENCE DEGREE PROGRAM WORK WITH MY SCHEDULE? An online environmental science bachelor's program offers students a flexible alternative to traditional, classroom-based education. Students can access course lectures and readings, participate in virtual discussions with other students, submit written assignments, take exams, and contact their professors from the comfort of their home computer. Current online learning technology also enables them to study on the move using a laptop, tablet, smartphone, and other Wi-Fi-compatible devices. For added convenience, online students can usually coordinate internships at sites near their current home. WHAT JOBS CAN I GET WITH MY BACHELOR'S DEGREE IN ENVIRONMENTAL SCIENCE? Many careers in environmental science are attainable with a bachelor's degree, although some may require some professional experience in the field. Common careers include positions as environmental technicians, natural science managers, conservation scientists, foresters, wildlife biologists, and natural resource managers. A bachelor's in environmental science is also a key step for students who plan to earn a master's or a doctorate in the field. WHAT ARE THE BEST ONLINE ENVIRONMENTAL SCIENCE DEGREE PROGRAMS? Choosing a program is a very personal decision, and only you can properly evaluate whether a target school's strengths match your educational needs. The following ranked list of schools should serve as a helpful starting point in your search for the best online environmental programs in the United States. 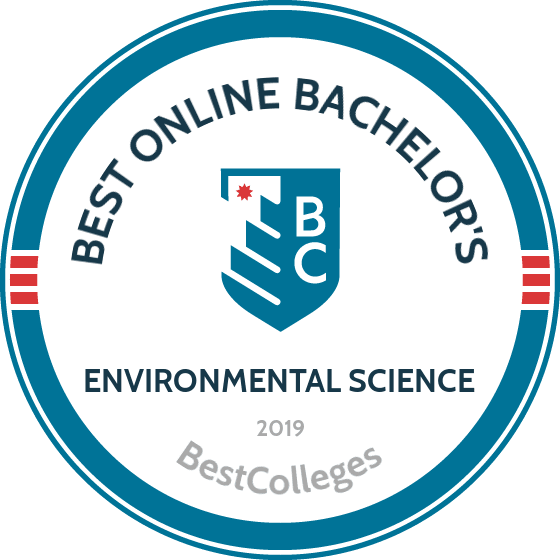 If you want to earn a bachelor's degree in the field, and you value the opportunity to take classes online, read on to learn more about the top online environmental science programs in the country. UF Online's BS in environmental management degree emphasizes agricultural ecology, hydrology, pest management, soil science, and water resource management. Delivered through the school's College of Agricultural and Life Sciences, the program prepares learners for careers in conservation, hydrology, sustainability, and zoology. Students complete 120 credits, including 32 major-focused credits and 27 elective credits. Although nearly all classes take place online, freshmen and lower-division transfer students must take required chemistry labs in person. They may do so at an approved state university or college campus, an approved regionally accredited school, or during a bootcamp-style experience in Gainesville, Florida. Individuals with at least 60 credits from an accredited institution can seamlessly transfer into the UF Online environmental science degree if they possess a minimum 2.0 cumulative GPA. They must complete two chemistry courses and a calculus course before transferring. UF Online maintains application deadlines in February, May, and September of each year. Students may begin the program in May, August, or January. The program admits candidates on a rolling basis. Applicants must submit high school and/or college transcripts, along with ACT or SAT scores if they received a high school diploma within the past five years. All UF Online learners can access the Student Plaza, which offers a digital gathering place for networking, chatting with academic advisers, and organizing study groups. Distance learners also benefit from a digital library and access to student clubs. SNHU offers an online environmental science bachelor's degree focused on using evidence-based and practical solutions to solve environmental problems. Students examine the effects of climate change, air and water pollution, overpopulation, and the loss of biodiversity on the environment and community health. In the natural resources and conservation track, students explore research and methods in remediating human-caused hazards and learn skills that they can apply in a business, nonprofit, or government setting. The program's geospatial technologies track emphasizes the use of geographic information systems to visualize and analyze data applicable to a variety of environmental issues. Students pursuing the 121-credit online environmental science degree take classes on environmental ethics, chemistry, biology, physics, and research methods. Two environmental science colloquia allow students to master tools and technologies critical to the environmental science field. These courses offer hands-on activities that provide students with real-world experience using software and systems. Applicants submit high school transcripts and transcripts from any colleges or universities previously attended. They must also submit an electronic attestation form to verify that they received a high school diploma or GED. SNHU charges the same per-credit tuition for resident and nonresident students. Active military personnel and their families benefit from a discounted tuition rate. The university also features Pathways to Math Success, which enables students to take math assessments and earn up to six credits for what they already know. In some cases, students who pass these assessments can graduate early. Students in the online environmental science bachelor's degree usually graduate in four years. The environmental science bachelor's degree online at OSU prepares students to evaluate and solve environmental problems related to pollution, climate change, and biodiversity. The 180-credit program offers several specializations, including applied ecology, environmental agriculture, and water resources. Students may also seek a geographic information science certificate focused on data collection, analysis, and visualization. The online environmental science degree program features classes on environmental law, climatology, urban forestry, and watershed management. The environmental science core comprises 27-34 credits in addition to 27 elective credits. Students must also complete at least three credits of experiential learning. Most students graduate within four years. The school maintains a transfer-friendly policy, enabling students to receive credit for courses taken at other accredited institutions. However, students must take at least 45 of their final 75 credits at OSU. All distance learning takes place through the Canvas learning management system. All online students pay the same tuition regardless of residency. Military members and their families enjoy reduced tuition along with assistance applying for financial aid and veterans benefits. All distance learners can access a 24/7 digital library, career services, academic advising, online tutoring, and individual success coaches to help them stay on track toward graduation. OSU's online environmental science bachelor's degree program features four start dates throughout the year. The University of Alabama's fully online BS in human environmental sciences offers diverse courses on subjects like communication, entrepreneurship, public health, management, and technology. Thus, students can structure the program to meet their interests and goals. The 120-credit online environmental science degree includes courses on sustainability, energy policy, resource management, and environmental law. During a course on human environmental sciences, learners explore the history and philosophy behind the discipline and how environmental issues affect cultures and societies worldwide. The environmental science online degree program's asynchronous format means students can take courses at their own pace. Distance learners gain access to 24/7 technical support, academic advising, and tutoring, as well as a digital library, writing center, and career center. Military members and their families benefit from GI Bill assistance and the VetSuccess Center through which dedicated coaches help students remain on track toward graduation. The university offers the same per-credit tuition rate to all online learners regardless of residency. To apply as an incoming freshman, prospective students must submit high school transcripts and ACT or SAT scores. Transfer students provide official transcripts from any accredited colleges and universities previously attended. To graduate, students must achieve a C grade or better in all college courses and earn at least 30 credits through the University of Alabama. The school is located in Tuscaloosa. Through UMUC's online BS in environmental management program, students learn how to identify, evaluate, and find solutions to environmental problems like pollution, climate change, and loss of biodiversity. Learners study various environmental regulations and how to apply scientific principles to complex issues. Students may focus their studies on sustainability or toxicology and hazard control. The 120-credit online environmental science degree features courses on diverse topics, like regulation, policy, technology, health, and management. Students also take an introductory course on geographic information systems, giving them familiarity with the software and tools that enable professionals to assess environmental challenges and develop data-supported solutions. The university's streamlined application process does not require ACT or SAT scores, although students must provide official high school and/or college transcripts. Prospective transfer students need a grade of C or better in all courses for which they seek UMUC credit. The university maintains articulation agreements with all 16 of Maryland's community colleges, along with nearly 100 two-year schools across the United States. Once enrolled, distance learners can access academic advising, career planning advice, digital library services, technical support, writing help, and online tutoring. They may also participate in student clubs without attending meetings or events on campus. The school maintains a generous transfer policy, accepting up to 90 credits from other accredited postsecondary institutions nationwide. Although UMUC charges different tuition rates for resident and non-resident students, the university offers special discounts for military personnel and their families. There is no programmatic accreditation for this major field of study at the undergraduate level. Students should defer to the regional or national accreditation of their four-year college or university. The job outlook for environmental science professionals has improved in recent years, largely thanks to an increased emphasis in climate change science and renewable energy. According to a recent survey by Georgetown University's Center on Education and the Workforce (CEW), experienced college graduates with a bachelor's degree in environmental science face an unemployment rate of just 4%. The table below uses CEW data to compare the unemployment outlook between environmental science degree holders and college graduates with degrees in related disciplines. As the table shows, environmental science majors with professional experience have the lowest unemployment rate among all degree fields listed. For context, the national unemployment rate is currently 4.9%. In addition to low unemployment rates, students who earn a bachelor's in environmental science also enjoy relatively high earning potential. According to the 2015-16 PayScale College Salary Report, environmental science degree-holders earn a median annual salary of $43,300 during their first five years on the job, and $77,000 after a decade in the workforce. This represents a 77.8% increase in salary between these two stages. The table below explores salary expectations at two key career benchmarks for students who major in environmental science and related fields. Of the seven academic majors listed, environmental science held the third highest salary at both the entry-level and mid-career mark. With the exception of environmental management, employees in all of these fields saw their salaries grow by more than 70% between the two career stages. Your salary expectations should also depend on your specific job title, as well as other factors like your company's size and location. The next table examines career salary growth in five of the most common environmental science occupations. Of these five careers, environmental scientists experienced the highest rate of projected career salary growth, with an 83.5% increase between their first job and late-career. Environmental engineers placed second: these professionals saw their salaries rise 64.4% after 20 years on the job. The remaining three careers experienced salary growth at rates ranging from 51% to 54%. Students who graduate with a bachelor's degree in environmental science will be qualified for dozens of entry-level positions in the field. Below, we've highlighted four of the most common career pathways for environmental science graduates. Environmental Scientists and Specialists: Environmental scientists and specialists study the relationships between humans, other organisms, natural resources, and other key components of the ecosystem. They often advise elected officials, business executives, policymakers, and other leaders about the importance of sustainable business and development. They use field samples, recordings, surveys, and other forms of evidence to inform their analysis. Environmental Engineers: These engineers design and develop environmentally-friendly solutions to problems related to soil, water, air, and other natural resources. Their work primarily focuses on contemporary issues like renewable energy, pollution, climate science, waste disposal, public health, and recycling. Zoologists and Wildlife Biologists: These scientists study various animals, plants, and other organisms in order to learn how they interact with one another in different ecosystems. They collect field samples, run lab tests, and write reports about current ecosystem activities. Zoologists and wildlife biologists often specialize in specific ecosystems, such as forests, deserts, and aquatic environments. Conservation Scientists or Foresters: Conservation scientists and foresters oversee day-to-day operations in forests. Depending on where they work, these professionals may interact with a range of other people, including loggers, wildlife biologists, land developers, and private property owners. Making professional connections and learning as much as you can about environmental science is crucial to your success. Professional organizations offer a great entry point for students who want to learn more about their chosen career path. Below you'll find three of the country's most prominent organizations established for environmental science professionals. These organizations host networking events, provide online trainings, maintain active job boards, and offer other services for career-ready college graduates. National Association of Environmental Professionals: Founded in the 1970s, the NAEP sponsors 14 state, multi-state, and regional chapters nationwide. Membership benefits include complimentary newsletters and publications, reduced tuition for webinars, and entry discounts to official NAEP events. American Academy of Environmental Engineers and Scientists: This STEM-driven organization was founded in 1955, and today offers membership options for professionals and students. Other perks include mentorship and professional certification opportunities. The Institution of Environmental Sciences: According to its mission statement, the IES is "a visionary organisation leading debate, dissemination and promotion of environmental science and sustainability.” The institution's website includes job listings, a resource library, and an extensive blog covering various topics related to environmental science. Despite the relative affordability of online programs, most students still need financial assistance. Students should complete a Free Application for Federal Student Aid (FAFSA) form to learn more about loans, grants, and other opportunities offered through the U.S. government. Additionally, private grants and scholarships are widely available through nonprofit organizations, companies, and other sources. Check out our collection of resources below to learn more about your financial aid options.